A little over a year ago I posted a photo of this wonderfully ramshackle and incredibly faded old sushi restaurant. At the time, the old man standing by the door led me to believe it was still a going concern. Subsequent walks past, however, appeared to suggest otherwise. There was sometimes a light on which seemed like a good sign, but there was never a telltale noren outside indicating it was actually open. Until, that is, I passed by during a photowalk tour over the weekend. The old man was there as expected. 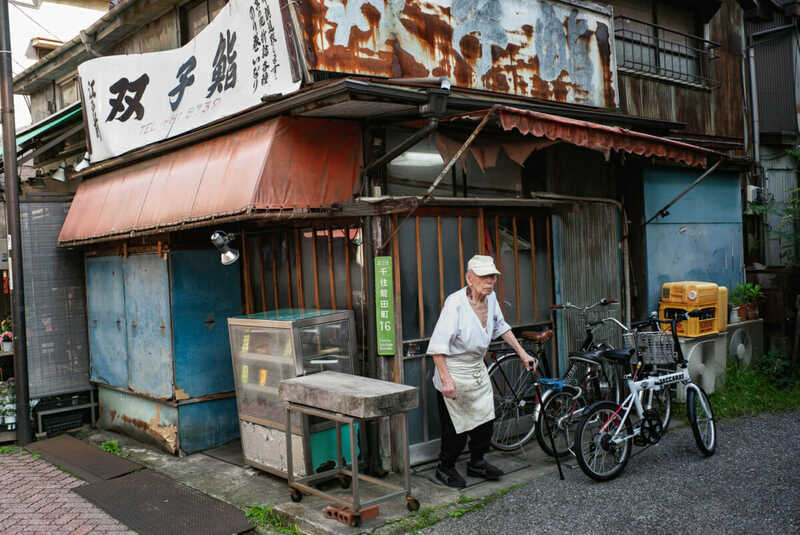 It is, after all, his shop — one he started 60 years ago. But these days he only serves tea and helps out a bit with preparation. Instead, his son is now in charge. A man who may lack the experience of his father, but most definitely none of the skills, as the food was as delicious as the restaurant is dilapidated. Yeah, it really is. A very special place indeed. Always enjoy passing by, so to see it actually open was a treat and then some! It has, but it’s all the better for it! Wonderful find, and good to hear it is still functioning. It’s not often you do a portrait like that but, as with other sushi chefs I’ve seen, they do have a certain presence which you have captured here. Love the Kitanachelin award from 2010 on the wall. From the number of such places you find and show us it doesn’t suprise me that there was (is?) a TV show dedicated to them that makes these awards. Yeah, I was so pleased to see it actually open. Got more than little excited if the truth be told. And yes, I totally agree about the presence. 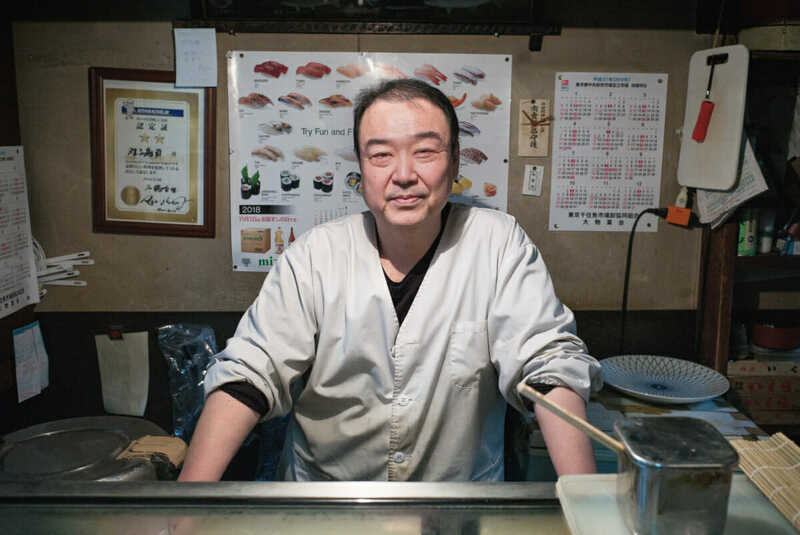 A man happy with what he does, and happy to know he’s good at it — in a suitably humble sushi chef way of course! Haha, no surprise at all. Seeing that certificate made me chuckle. Not sure many other countries would have such an award. Yes, presence is a good way to describe the chef. If anyone wants to visit, …………… Itadakimasho. Sorry. Really not a fan of deleting a comment. Or in this case part of a comment. Thankfully I very rarely have to, but I purposely never give out addresses. Not, I hope, because I’m being selfish and trying to keep it for myself, but because it’s just not what this site is about. Also, and perhaps more importantly, like many such restaurants and bars, it’s a real locals place. The occasional foreigner dropping by wouldn’t make any difference of course, but a regular stream could change the dynamic, and I really wouldn’t want that. Not that this site has those kinds of numbers behind it. I’m well aware of that. But a link here and there could send the location far and wide. Those who really want to find it will. And that’s a good thing. I also have given locations out to people when they’ve asked. But again, not in such a public way. Hope that explains my decision to do something I really don’t like to do. Again a nice and interesting post, thanks. You are more than welcome. This place is a real favourite of mine, so happy to hear you like it as well. I can well imagine. It really is a great place just to wander and see what happens.